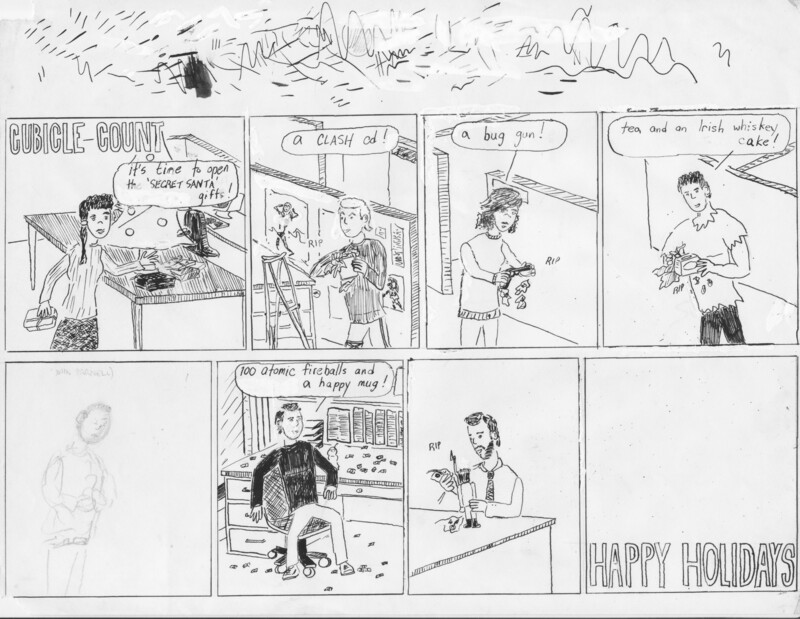 Found this unfinished strip in a random box in my closet. The presence of Dave and “Riley-tron” in EID dates it to 1991. Another Celia-driven EID holiday activity—the time-honored tradition of the Christmas gift exchange. I know all these presents were actually received by the people as shown here. Note the Michael Jordan poster in Joe’s cubicle, as well as the poster of the swimsuit model (whose identity has been lost to time). Amusingly, from the Wite Out, it looks like I was having trouble “figuring” out a way to draw her…”gifts.” Ah, Joe, you rogue. I like the way the cartoon was coming out and can only conclude that this was yet another strip where I didn’t have a clear idea of a punch line or ending (it’s weird that I didn’t always know what I wanted to draw when I started one of these). What’s especially odd about this is that this is the only Cubicle Count to span more than four panels (maybe this was the Sunday color strip). That’s a lot of drawing for no payoff. Another weird thing is that I think I may have drawn this with pen and ink…as in, with a dip pen. I know that was something I played with at one point. I like the look here. 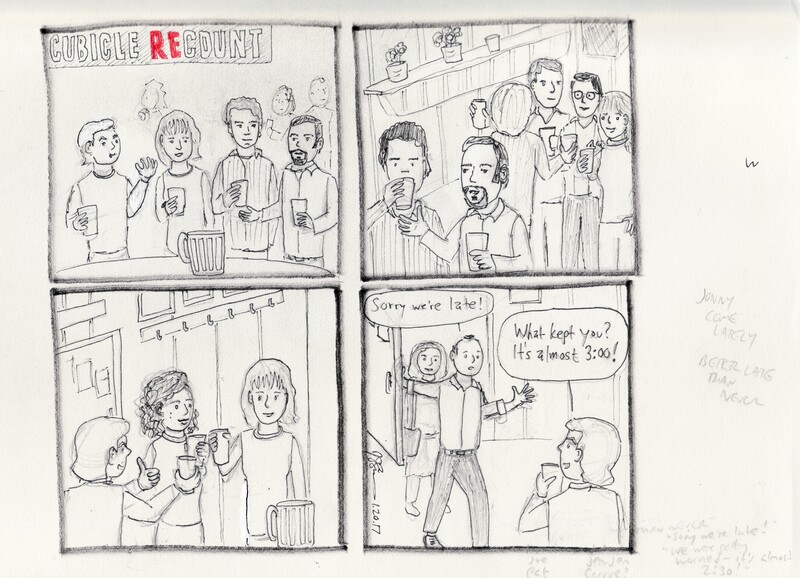 I’m sorry I didn’t finish this one, as it would have been nice to get John Parnell—who was probably Cubicle Count’s biggest fan (he always stopped by my desk to look for new strips)—into the “canon.” As the pencil note indicates, that’s John in panel 5. Was the whole “Happy holidays” vs “Merry Christmas” battle the big deal in 1991 that it seems to be these days? I know it was something I thought about long before it became such a thing; it’s exactly the kind of thing I waste thought and energy worrying about. Funnily enough, this is about as clear as my ACTUAL memories from Cherry Street! So last night I had the extreme good fortune to reconnect with a couple of the old crew from BIOSIS. Appropriately enough, we reconnected over beers (though of better quality and lesser volume than in the old days), and naturally enough there were retellings a’plenty of the BIOSIS glory days. Hanging out with these guys never stops being great. Of course, I took the opportunity to plug this little blog (I mean, really, if there’s ANYONE who’s going to find any value in these old Cubicle Counts, it’s these guys). But—quite rightly—Keith called me out on something I had myself noted in the commentary on another blog entry (“Interro-BANG!”): a lot of the most important people and events from the BIOSIS days slipped by uncaptured in the Cubicle Count records. It’s a gap that I intend to address (again, see “Interro-BANG!”); I have quite a few ideas for new strips already lined up. Indeed, I already have one almost completely sketched out. 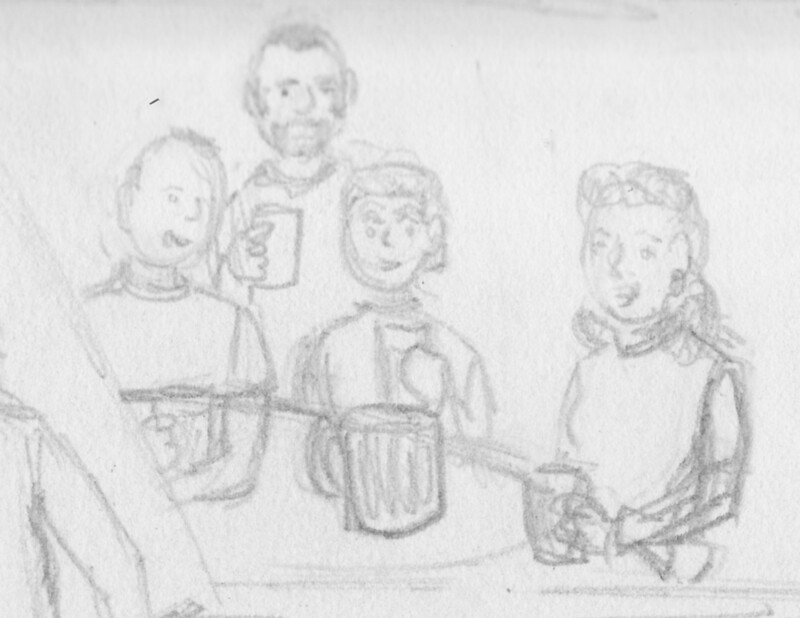 As a show of good faith—and to ensure that two essential BIOSIS institutions (Keith and Cherry Street Tavern) get added to the Cubicle Count canon—I’m going to throw this preview out there. I had a great time going through the Cubicle Counts and reminiscing about the BIOSIS “glory” days. Which brings us here. For obvious reasons, this time around I’m not going to follow my usual practice of tagging all the people that appear in the, um, strip. But there’s no question that the Cubicle Count oeuvre would be incomplete without an appearance from this character, and here she is (and then some!). I only just drew this, but already I’ve found something I wish I’d done differently: despite the title, I didn’t use an actual interrobang (‽). Should have used one in panel 3. Without looking back through my journals, I’d peg this “missing” Cubicle Count to late 1992. 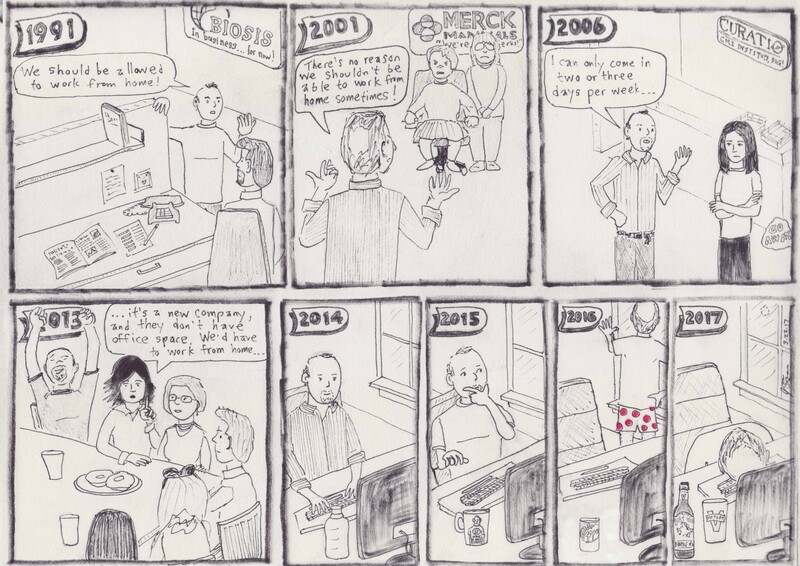 Cubicle Count was something I’d all but completely forgotten, but now that I’ve revisited them I’m feeling irrationally proud of the strip. It’s certainly not an issue of thinking the drawings are good or that the strips are funny or clever, it’s more just the satisfaction of having stuck with a project like this for a while. Before I close the book on the original (!) Cubicle Count run, I should throw the few unfinished strips I found onto the pile. None of these strips have dates, but I can tell from what’s going on in them roughly when I drew them. This first one dates to October 1991. 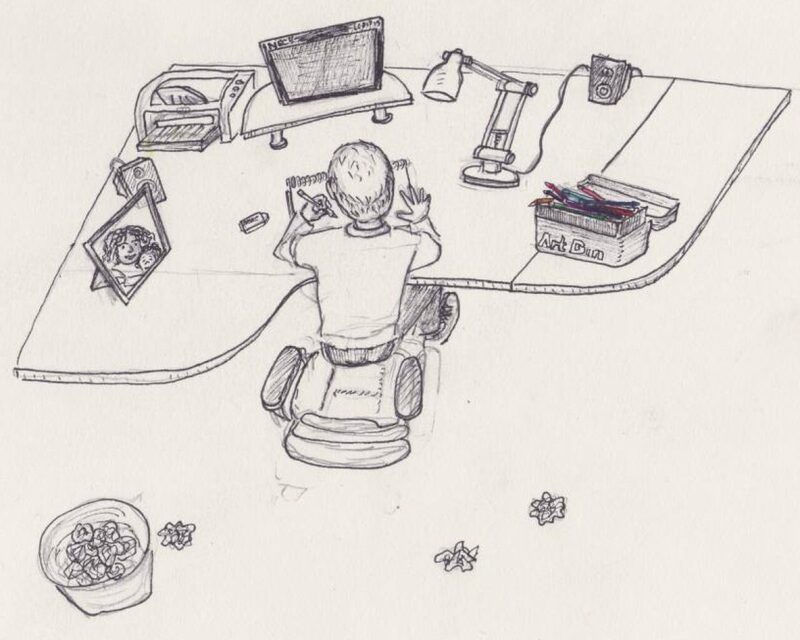 I can tell this for the following reasons: the protagonists (Joe Riley, Kathryn Kerby, and Beth Ahrens—sorry Beth, your only CC appearance got left on the drafting table) are from the department I would eventually transfer to, Special Analysis (I know, I know). This was before Joe (“Riley-tron!”) was temporarily transferred to EID and before Kathryn and Beth left the company. Also, this was supposed to be a Halloween-y strip. The idea (which I am surprised I remember) was supposed to be along the lines of Dawn of the Dead, with the EID staff (here represented by me and Celia) in the zombie role and Joe, Kathryn, and Beth the outside observers lamenting our sad plight. Though I remember the concept, I DON’T have any idea how I intended to wrap up this strip…which is probably why I never finished it. I also have no idea what dialogue I had in mind for the characters, though Joe (panel 2) and Kathryn (panel 3) are obviously speaking. Without remembering what I had in mind, I can say almost for certain that the panel 4 drawing would have had Beth delivering a punch line. Beth from that era seldom failed to get the last word (a trait she shares with Beth from this era). Drawing-wise I’m pleased with how everyone translated into their cartoon alter egos (though Beth in panel 3 has that slouchy, short-armed posture that I dislike in a lot of my drawings). 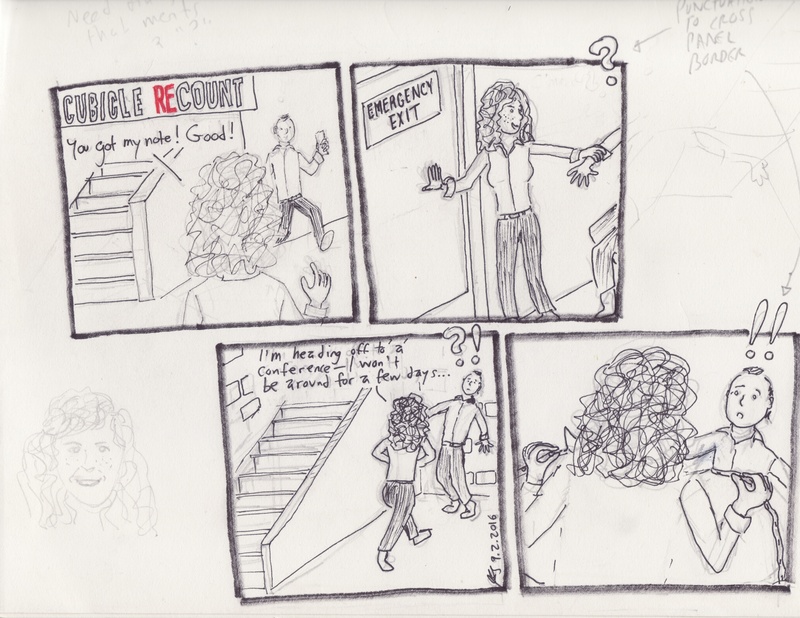 There’s no way anyone but me would know this, but Beth in panel 1 is reaching to open the door to the fourth floor. This next one was from around December 1991. I was starting to hang with Tracey more, so we had a little bit of a workplace pal routine starting to take shape. As with the previous unfinished comic, I have no idea where I was going with this one. 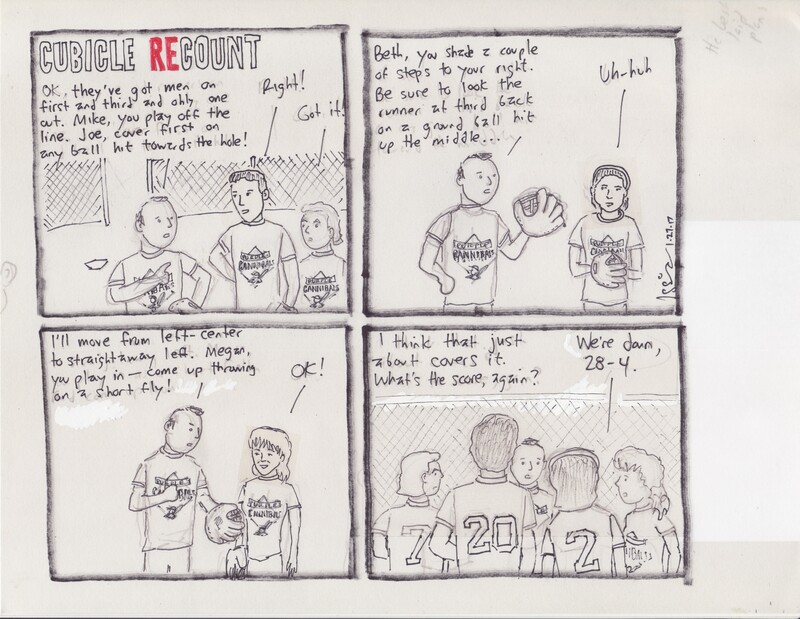 This one dates to June-July 1992, and it answers the question of why there was a several-month gap in the strip: I broke my left wrist and arm playing softball that year, so I couldn’t draw. The proof is right here: my one attempt to draw the strip right-handed. Kind of a gimmicky, stupid idea, but I was probably dying to draw at this point, so I’ll cut myself some slack here. And, finally, the one storyline I really wish I HAD finished. This was to be a multistrip wrap-up to the Cubicle Count run. I had gotten my transfer to Special Analysis (“yayyyy!”), and the plan was to leave EID in a blaze of glory by using a squirt gun full of Wite-Out to deliver Tracey, Celia, and my other EID friends from the nefarious grip of…I don’t know. Paul was hardly a villain, so I don’t think I’d have Wite-Outed him. Perhaps I would have drawn Bernadette Freedman (the EID department head) or Joel Hammond (arrogant perpetually self-satisfied EID section chief). Well, we’ll never know now. It amuses me to see how little I’ve changed. Tracey’s panel 1 dialogue is unfinished, and I just KNOW it’s because I wasn’t sure how “Wite-Out” was spelled. I’m OCD enough that I would HAVE to get that right. But at least I’d finally learned to leave toom for the strip’s title: see how Tracey’s talk bubble politely leaves space at the top of the panel.